Aviv Amirav, Tel Aviv University and Aviv Analytical, Tel Aviv Israel. 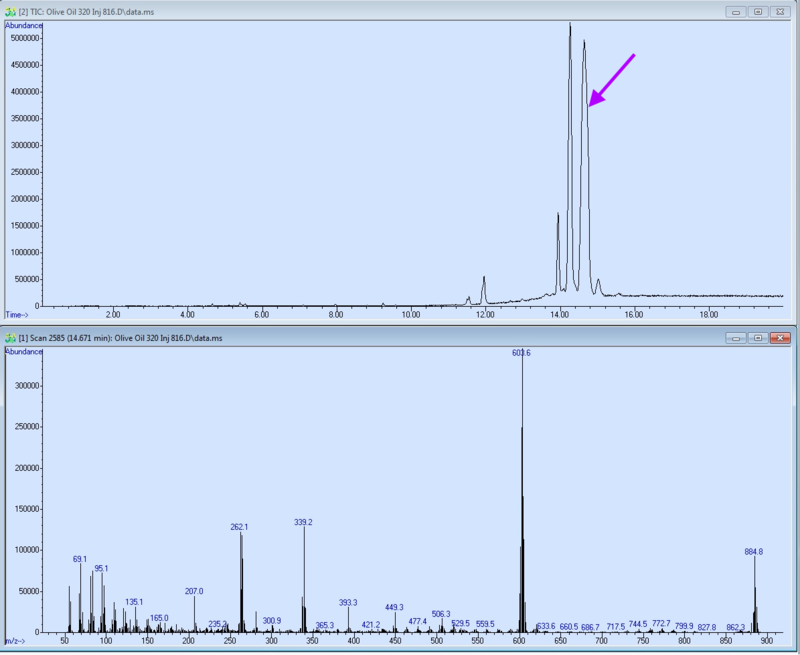 Triglycerides analysis is challenging since these large compounds do not elute from standard GC columns under the conditions used in GC-MS and furthermore their standard EI mass spectra do not exhibit any molecular ion, as shown in the NIST library. In addition, their analysis by LC-MS is also challenging in view of their poor proton affinity. 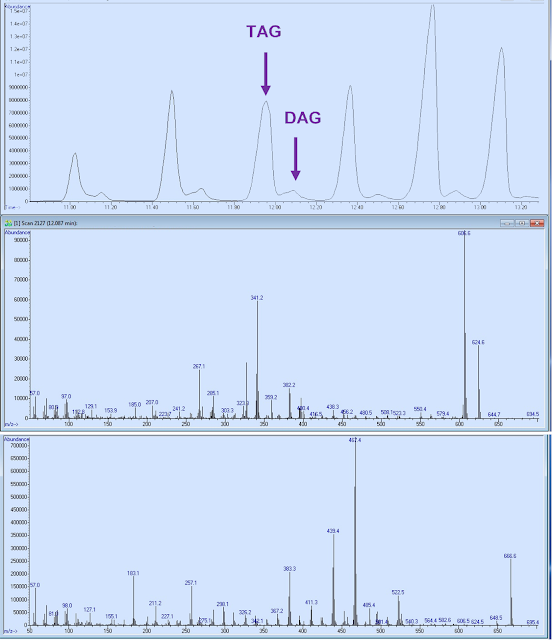 Thus, and in view of the importance of triglycerides analysis we decided to analyze three oil samples that were previously analyzed by GC-FID in order to evaluate these oils analysis by GC-MS with Cold EI. The challenge was to properly elute these large compounds and demonstrate the availability of abundant molecular ions plus useful and informative high mass fragments. Triglycerides analysis is very important for the food industry and such analysis can also be potentially important for human medical diagnostics in the form of cholesterol and triglycerides analysis in blood. Currently triglycerides are hydrolyzed and methylated to form FAMEs (fatty acid methyl esters) that are analyzed by GC-MS. However, in such analysis vital information is lost on the actual structure and concentration of the various parent triglycerides and GC-MS with Cold EI is challenged to exhibit such information. 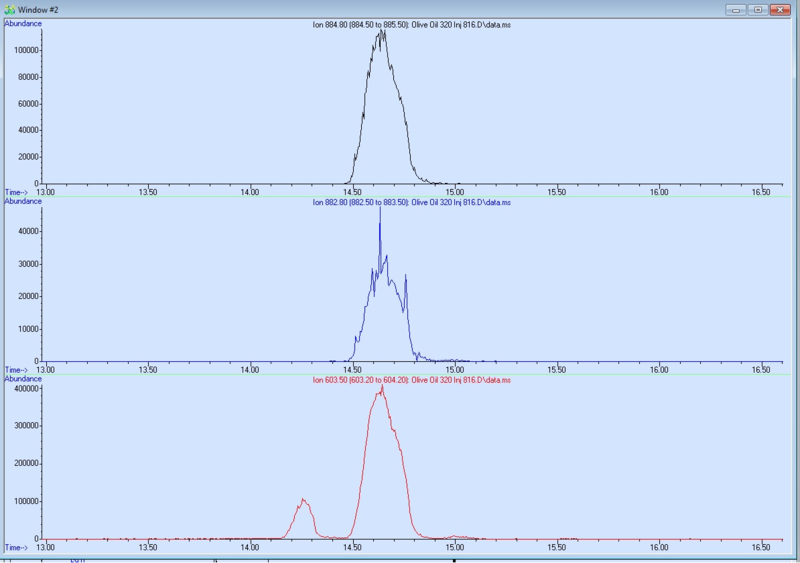 GC-MS with Cold EI System: 5975-SMB GC-MS with Cold EI system of Aviv Analytical, based on the combination of an Agilent 5975 MSD (and 7890A GC) with the Aviv Analytical supersonic molecular beam interface and its fly-through ion source. The system used has a five years old fly-through ion source that was never serviced and which still uses its original filament and ion cages. The system was operated by Aviv Amirav. Samples: Three oil samples were analyzed of: a) MCT oil (medium chain length triglycerides); b) Interesterified Palm oil; c) Olive oil. We received these oils in neat conditions in which oils a) and c) were liquids while oil b was a white soft waxy material. We diluted the oils to be at 0.3% (3 mg/ml) in hexane and we also made 0.6% sample from the interesterified Palm oil. Injection: 1 or 2 µL at 300ºC split splitless injector temperature with split ratio of 9:1 thus ~300-600 ng oils were injected on column (1200 ng in one of the Palm oil). Column: 15m length, 0.32 mm ID and 0.1 µm DB1HT film was used. He column flow rate: 8 ml/min for 12 min and then flow program up at 3.2 ml/min.min to 24 ml/min column flow rate and hold at 24 ml/min for 3 minutes. The use of high column flow rate with flow program was essential to elute the large triglycerides. Alternatively, we used higher GC oven temperatures up to 380°C but it resulted in having higher column bleed thus upper GC oven temperature of 350°C and column flow program were preferred. Oven: 70ºC followed by 20ºC/min to 350ºC and wait 6 min for the total run time of 20 minutes. This run time is considered as fast for such analysis. Cold EI Source: 7 mA emission, 70 eV (18 eV was also used once and showed no gain) electron energy, 60 ml/min He makeup flow. Transfer line temperatures: It was 250ºC for 4 min followed by temperature program at 12°C/min to 350°C and wait 7.7 min. Mass spectral range and scan speed: 50-1040 amu at about 1.9 Hz scanning frequency. 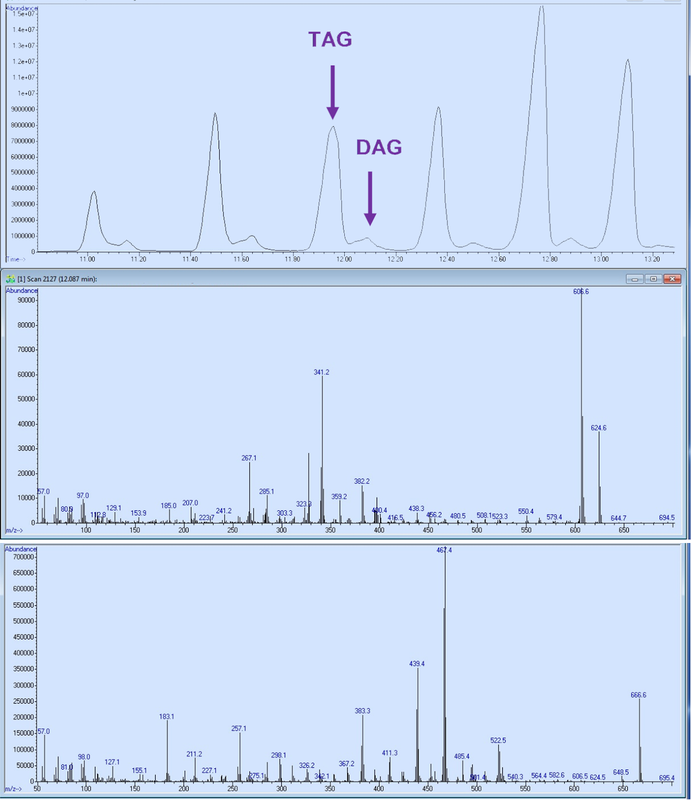 All the triglycerides were eluted with GC-MS with Cold EI and exhibited good peak shape without any ion source tailing. The biggest and last to elute triglyceride was with molecular weight of 1031.0 which has the elemental formula of C67H130O6 (Carbon number CN64). Note that the 130 hydrogen atoms resulted in 1.0 amu high mass shift. Cold EI excels in the elimination of ion source peak tailing and thus all peaks were tail free. Cold EI provided molecular ions information for all the triglycerides. The Cold EI mass spectra of all the triglycerides in all the three oils exhibited useful molecular ions with relative abundances in the range of 10-50%. This molecular ions information was not only important for the elucidation of the structure of the triglycerides but it also helped to resolve co-eluting further unsaturated triglycerides in majority of a given triglyceride. Cold EI provided informative high mass fragment ions information. As a result it is possible to more accurately obtain the structure of the triglycerides. Cold EI provided useful information on diglycerides that eluted among the triglycerides. The Cold EI mass spectra of diglycerides were characterized by having abundant molecular ions plus a nearby high mass fragment of M-18 in view of loss of water. The sensitivity was good and ratio of triglycerides signal to column bleed background was very high. This high ratio of signal to column bleed is another beneficial feature of Cold EI. The analysis time was relatively short at 20 min. Unexpected GC peak broadening was found in olive oil. This observation was particularly evident with olive oil in which the most abundant peak of glycerol trioleate was relatively broad. The common perception is that such broadening emerges from the coelution of several triglycerides with different degrees of unsaturation. However, we found that the majority of the broad peak is triolein with some addition of triglyceride with 4 double bonds but the triolein itself had a broad GC peak. While one explanation is that there can be a few isomers in the fatty acids our speculation is that the position of the double bond in the oleic acids is migrating at the hot (350°C) GC column or alternatively it undergoes quick cis-trans isomerization. This observation is new and to our knowledge unreported and thus requires further investigation about its source. In the nine figures below we demonstrate our findings and further discuss them. Figure 1. 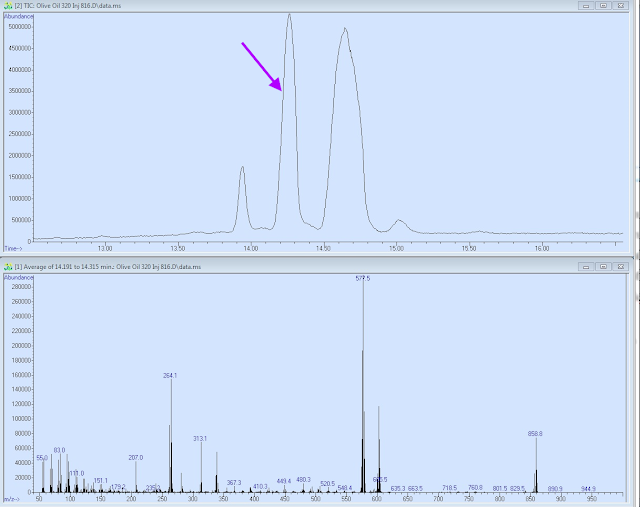 Cold EI total ion mass chromatogram and three Cold EI mass spectra of triglycerides of interesterified Palm oil. 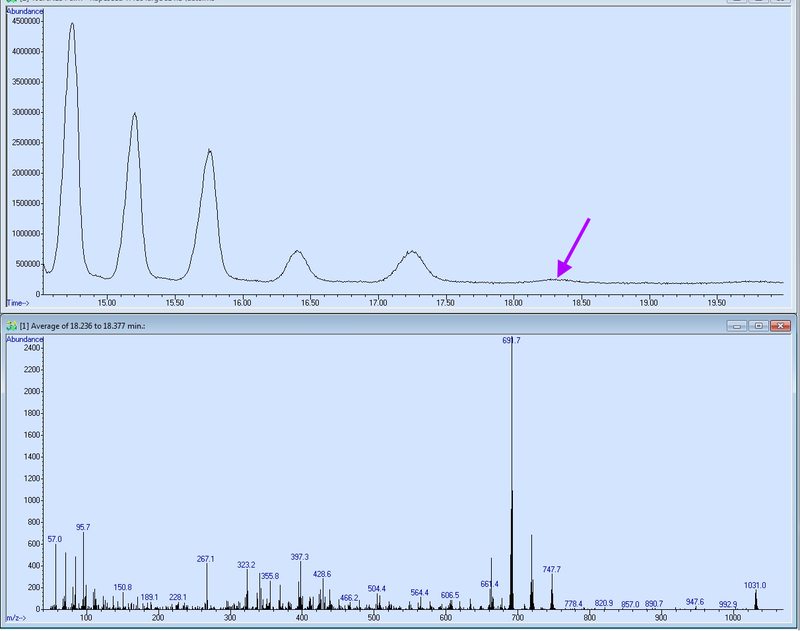 The representative Cold EI mass spectra were obtained on the arrows indicated TIC mass chromatogram peaks. Note the availability of useful molecular ions plus informative high mass fragments. Loss of 199, 227, 255, 283, 311 and 339 Da correspond with losses of the acyloxy ions of the saturated fatty acids C12, C14, C16, C18, C20 and C22, respectively. 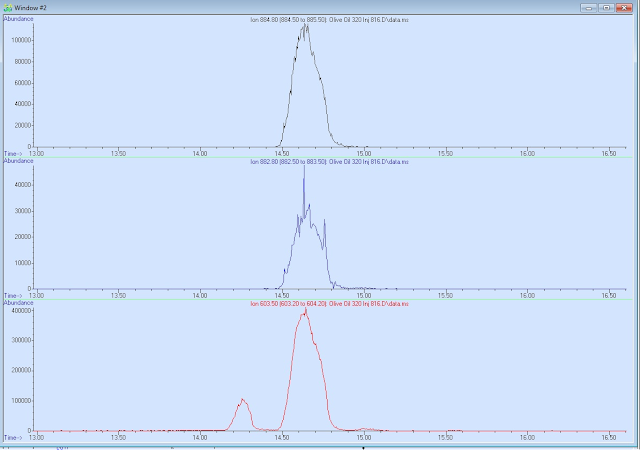 The TIC mass chromatogram is fast (20 min) and exhibits symmetric tailing free peeks and high ratio of signal to column bleed, which is challenging for these large triglycerides. Figure 2. Late elution time portion of the total ion mass chromatogram of interesterified Palm oil (upper trace) and Cold EI mass spectrum of the last to elute triglyceride. The molecular ion m/z=1031.0 belongs to a triglyceride with elemental formula of C67H130O6 (Carbon Number 64). The Cold EI mass spectrum shown was obtained after background subtraction to eliminate column bleed interferences. This is the last to elute triglyceride in this oil yet it gives visible and useful molecular ions and additional useful identification information. Figure 3. The analysis of diglycerides among triglycerides in the interesterified Palm oil. 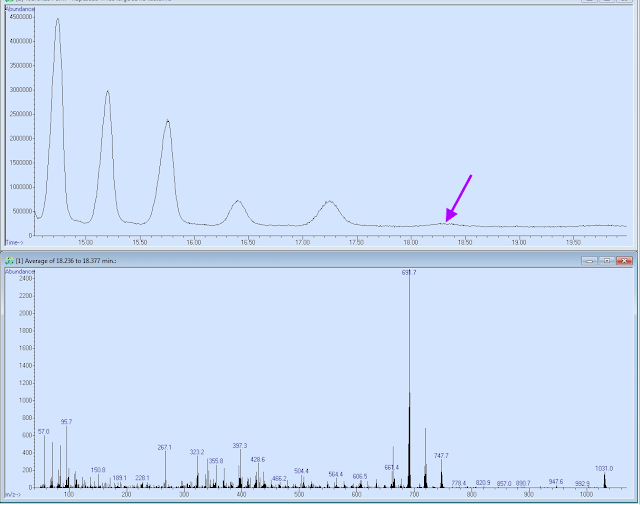 The upper trace is a zoomed total ion mass chromatogram with arrows on the time in which the bottom two Cold EI mass spectra were obtained. 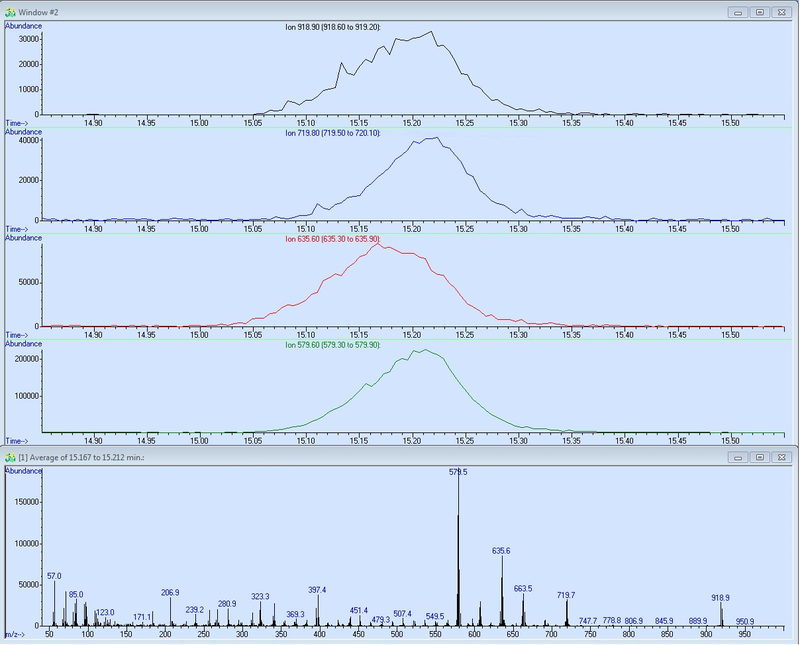 The middle trace Cold EI mass spectrum is clearly of a diglyceride as it has a dominant M-18 water loss fragment ion plus its molecular weight of 624.6 is smaller than of the nearby eluting triglyceride with molecular weight of 666.6 in view of the greater polarity of the diglyceride. Figure 6. 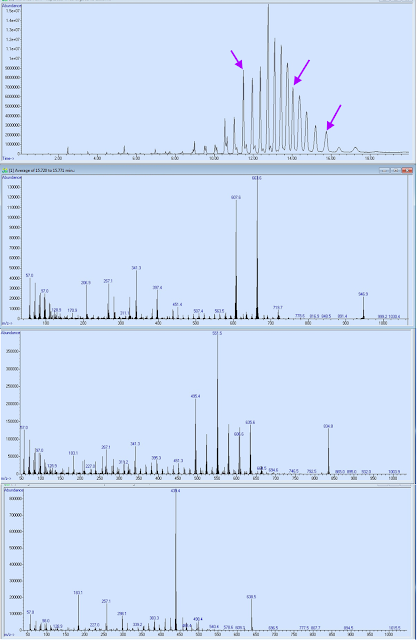 The analysis of MCT oil (medium chain length triglycerides) with GC-MS with Cold EI. 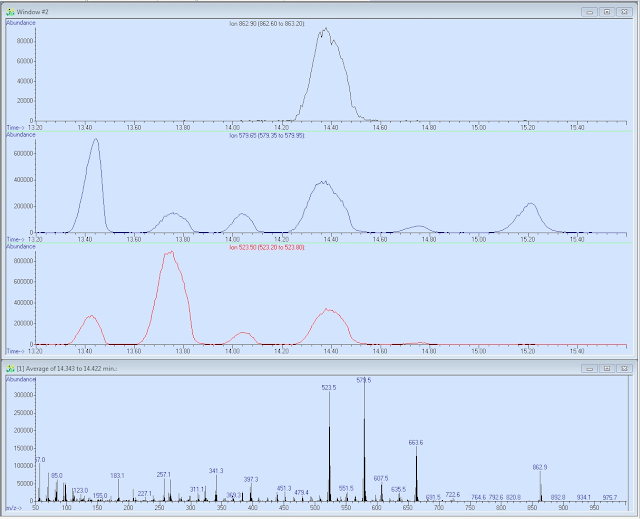 Total ion mass chromatogram is shown at the upper trace and Cold EI mass spectrum of the biggest (most abundant) triglyceride is shown at the bottom trace. Note the availability of useful molecular ions plus informative high mass fragments. NIST identification number 1 was clycerol tricaprylate with 27.2% identification probability but the NIST library did not have a molecular ion. Based on the molecular ion, representing the carbon number 26, and the loss fragments of 171 and 143 (acyloxy ions of fatty acid C10:0 and C8:0) the triglyceride could be identified as dicaprilyc mono capric which fits the NIST # 2 C29H54O6 candidate (24.1% identification probability). 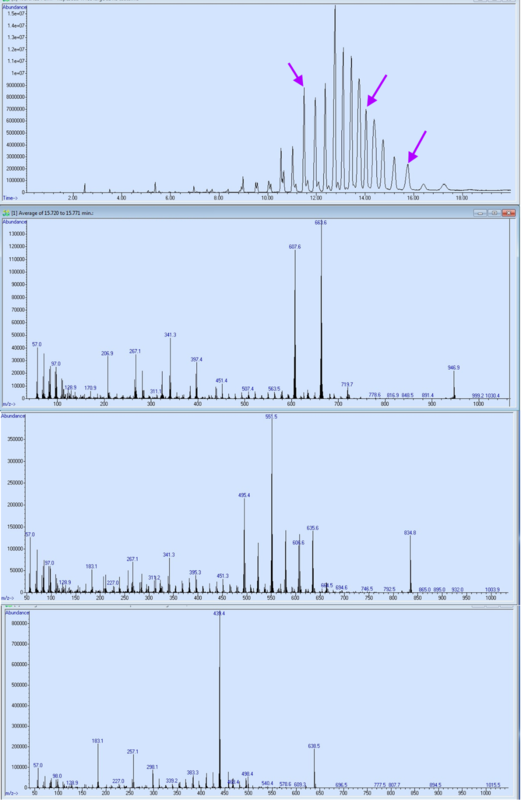 Our TAMI molecule identifier software gave C29H54O6 as its number 1 elemental formula. Thus, for small and medium size triglycerides Cold EI improves the NIST identification which becomes useless for large triglycerides in view of absence of molecular ions. Figure 7. The analysis of olive oil with GC-MS with Cold EI. 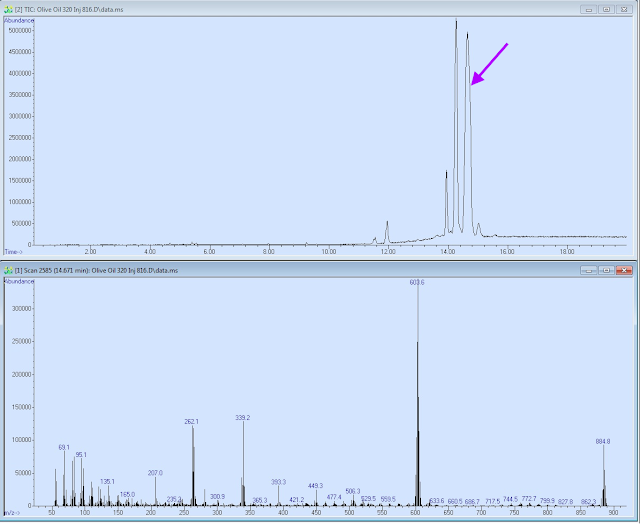 Total ion mass chromatogram is shown at the upper trace and Cold EI mass spectrum of the most abundant triglyceride (indicated by an arrow) is shown at the bottom trace. Note the availability of useful molecular ions plus informative high mass fragments. The molecular ions also exhibited M-2 ions of a triglyceride with additional degree of unsaturation. NIST identification number 1 was triolein C57H104O6 with 91% identification probability which was confirmed by the Cold EI molecular ions. Note the unusually broad triolein peak which we found to also depend on the on column injected amount. Figure 8. 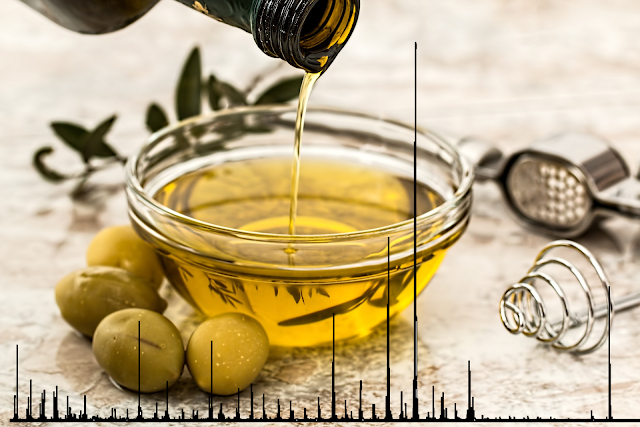 The observation of olive oil most abundant triglyceride GC-MS with Cold EI peak. 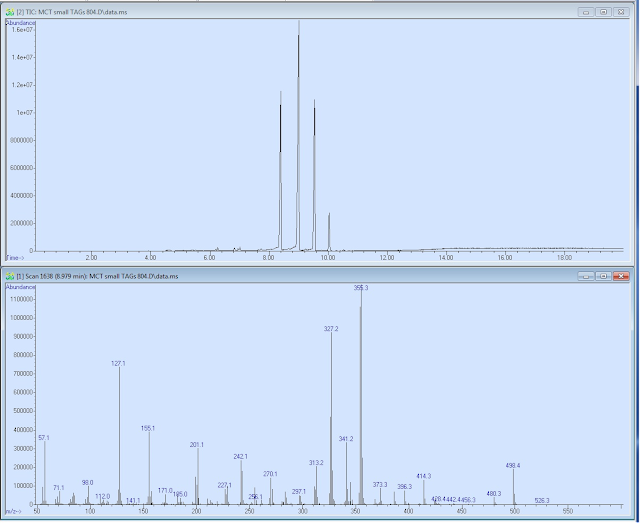 RSIM (reconstructed single ion mass chromatogram) of the triolein molecular ion m/z= 884.8 (upper trace) plus the molecular ion of triolein plus one additional unsaturation m/z=882.8 (middle trace) plus of the most abundant high mass fragment m/z= 603.5 (lower trace). 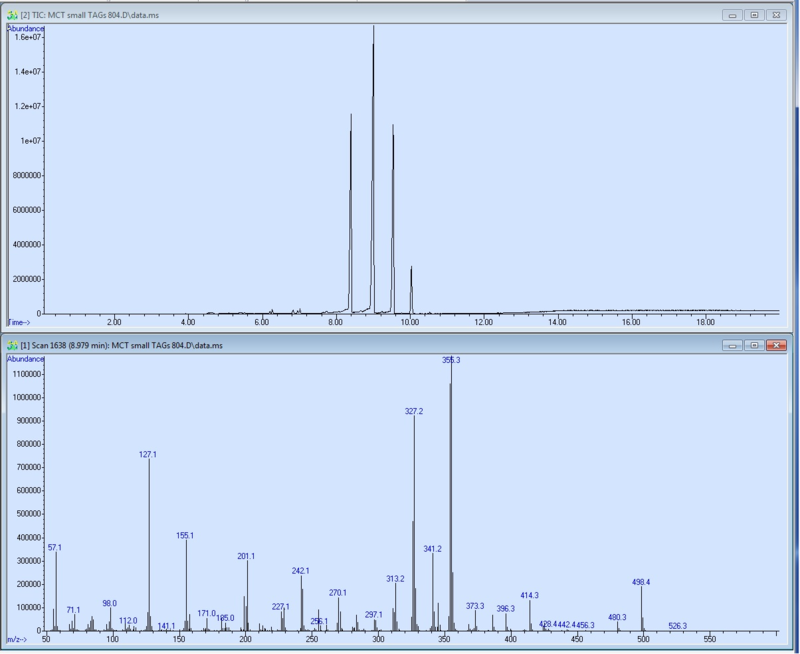 Note that the triolein and high mass fragment RSIM traces are similar and with the same small asymmetry while the M-2 is a little shifted to longer elution times plus it has some spikes from unknown source. 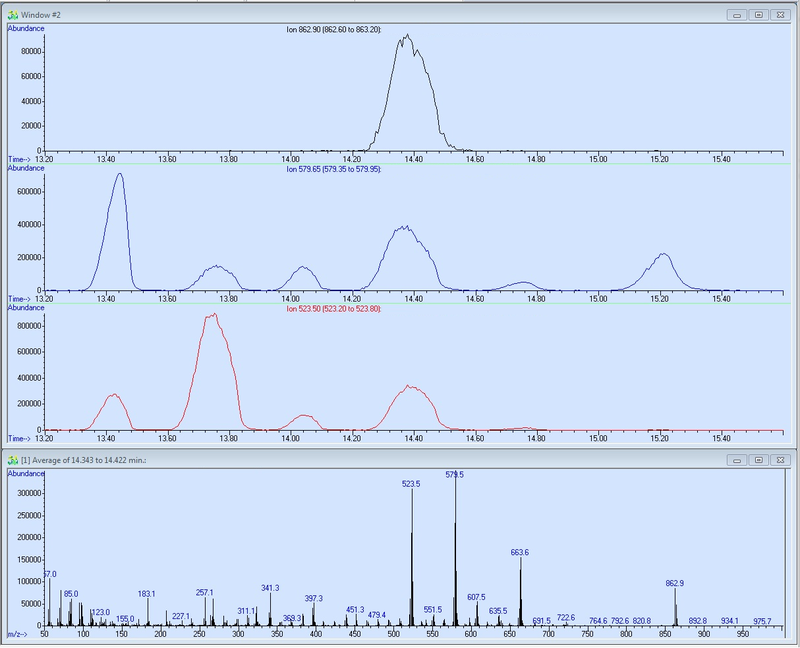 The RSIM trace of the fragment m/z=603.5 clearly demonstrates that the peak of triolein is broader than of the earlier to elute triglyceride. We speculate that the additional peak width emerges from positional isomers of the location of the oleic acids double bond which at the high GC elution temperature of 350°C can migrate or alternatively it undergoes quick cis-trans isomerization. Figure 9. The analysis of olive oil with GC-MS with Cold EI. Total ion mass chromatogram is shown at the upper trace (zoomed at the 12.5-16.5 elution time window) and Cold EI mass spectrum of the second most abundant triglyceride (tallest peak, indicated by an arrow) is shown at the bottom trace. Note the availability of useful molecular ions plus informative high mass fragments. The molecular ions m/z=858.8 also exhibits a clear M+2 and M-2 ions of a triglyceride with one less and one additional degree of unsaturation. Two main high mass fragments are observed which indicate that more than one fatty acid is included in this triglyceride. Thank you for your interest to share this information. Cold EI demonstrated its usefulness and is expressed in graphs. Triglycerides analysis is very important for the food industry and such analysis can also be potentially important for human medical diagnostics in the form of cholesterol and triglycerides analysis in blood. If you want essay related topic you can go for custom essay writing service will get better result.